A Grande Vegas Casino player had a dream come true the other day when she won a $6330 slots jackpot the day after fantasizing about it on Facebook. The casino is rewarding players with monthly cash prizes for posting a lifelong dream on Facebook. “Winning a jackpot” has been one of the most popular entries -- but no one really expected those dreams to come true. At least not so quickly. Like many of the casino’s Facebook Friends, ‘Tracy’ posted that one thing she’d really like to do at least once in her life is win a jackpot. The very next day she won a $6330 random jackpot playing the slot game Mystic Dragon. She shared her excitement with her Facebook Friends: "OMG! I love you Grande Vegas Casino! I listed in my "things I just have to do once in my life" to win a random jackpot, and I did it!!! I'm so excited! Thank you Grande Vegas for starting my new year out with such a blessing!!!" To enter the free contest, the casino’s Facebook Friends are asked to describe one thing they think everyone should really do at least once in their life. Every Thursday, Grande Vegas staff share some of their favorite posts with players and once a month one randomly selected player receives a $50 casino bonus. The Things to Do Once in Your Life promotion continues throughout 2013. 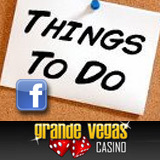 Grande Vegas Casino has a very active community of online casino players on Facebook. Players can read entries and enter their own wish at https://www.facebook.com/events/471634509541216/. Grande Vegas features Las Vegas casino favorites like Blackjack, as well as dozens of amazing slots games like the brand new Dream Run and Spirit of the Inca, making it popular with online casino players around the world.